It doesn’t take much to get in a killer fat-blasting workout. The best way to do this is to pick a handful of exercises and go through them, one at a time, with limited rest. In my Fat-Blasting Workout, I picked four exercises, targeting different major body parts, giving me the resistance with weights and the increased heart rate for a killer cardio workout. These four exercises will give you a full-body workout in less than 30 minutes. The fast-paced and limited rest circuit workout will leave you sweating and satisfied in not much time at all. As a busy mom, these are the type of workouts that offer me the results I want in the limited amount of time I have. Check out my Fat-Blasting Circuit Workout and let me know what you think! 1. Start with bar over shoulders (or without weight). 2. Step out to the side with one leg into a nice deep squat. 3. As you rise up to the starting position, bring your knee across your body towards your opposite shoulder. 4. Repeat until you complete reps on one side. Then move onto other side. 1. Start in a plank position. BOSU Ball should turned upside down with dome touching the ground. 2. 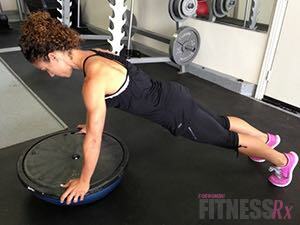 Keeping your core engaged, perform a push-up off the BOSU Ball. Repeat until you have completed 15 reps.
1. With the BOSU Ball turned right side up, lie with your back on the dome and feet place directly on the floor in front of you. 2. Allow your back to conform to the dome, extending your abs then crunch up towards the sky, squeezing your abs. Repeat until you have completed 25 crunches. 1. Grab dumbbells and lie on an incline bench, chest on the pad. 2. Your arms should be hanging straight down and on either side of the incline bench (this is the bottom of the rep and starting position). 3. Drive the dumbbells up until they are in line with your shoulders and parallel to the ground. 4. Bring the dumbbells back down to the starting position and repeat until you have completed 15 reps.
Rest for 3 minutes and repeat the circuit 3 times.